Chemistry rich diagrams: do crystal structures carry spin information? Iron-di-imine complexes. The collection is at DOI: 10.14469/hpc/2657. Here I track down how some of them are doing 20+ years on. 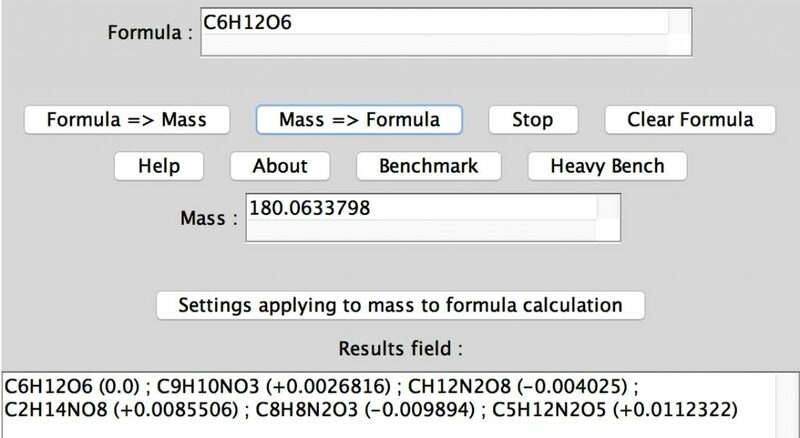 Formula-To-Mass-To-Formula (f2m2f), which was started in August 1996 and was written by Guillaume Cottenceau, a french undergraduate student visiting London and who wanted to learn to program. I suggested he try Java, and as I recollect sent him out to the business park west of London where Sun Microsystems had an office to learn how to do so (they had only released the development kit a few months earlier!). The applet he wrote still works (being unsigned, you have to jump through a few hoops to allow it to run (but be quick, not many browsers will still let you do so!). The applet also has a benchmark feature. Running the heavy bench now takes ~ 0.4s on a laptop. I cannot be sure, but I seem to remember that this one took ~20 seconds back in 1997. Guillaume then returned to Paris to finish the above off, but also managed to find the time a year later to produce Jspec, a visualiser for NMR and MS. Darek Bogdal was visiting from Poland in August 1997(8?) 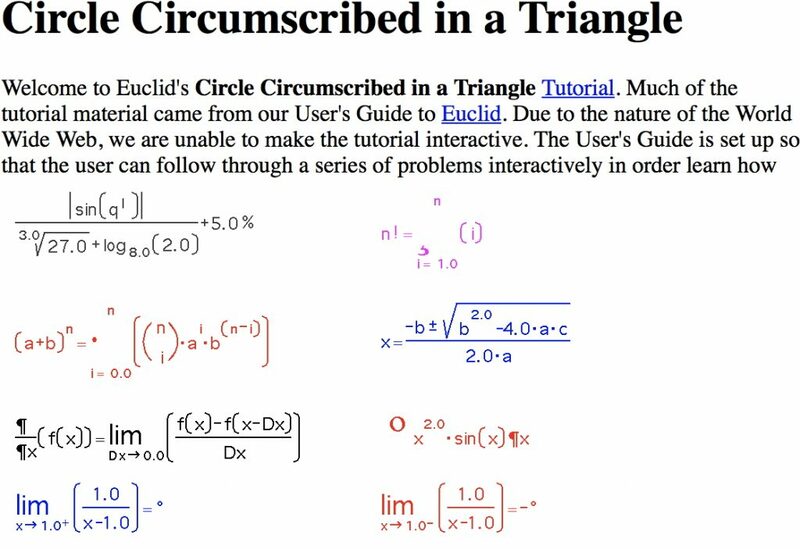 and he incorporated these tools into a general spectral display and problem solving resource, which also still mostly works (with no curation!). The bit that does not work depended on the Chime plugin, now long gone and of course replaced in large measure by Jmol and now JSmol. Here is an equation setter. The original site has long gone, but I had copied the classes over and it also (mostly) works! That said, many of the other links at DOI: 10.14469/hpc/2657 no longer work. In truth I am slightly surprised a few still do! Quite possibly these screen shots may be the only visual images that can be created in the very near future, as all but very specialised web browsers drop “plug-in” (aka Java) support. So perhaps it will be RIP Java, at least for the in-browser frame mode (but certainly not for the stand-alone application mode). This entry was posted on Saturday, June 10th, 2017 at 3:20 pm and is filed under Historical. You can follow any responses to this entry through the RSS 2.0 feed. You can leave a response, or trackback from your own site. The Java *applet* is pretty much dead. Java itself is not really, but not thanks to Oracle, it seems to me. Delving through the archives, I found this Jmol instance (using Java) from 2004. 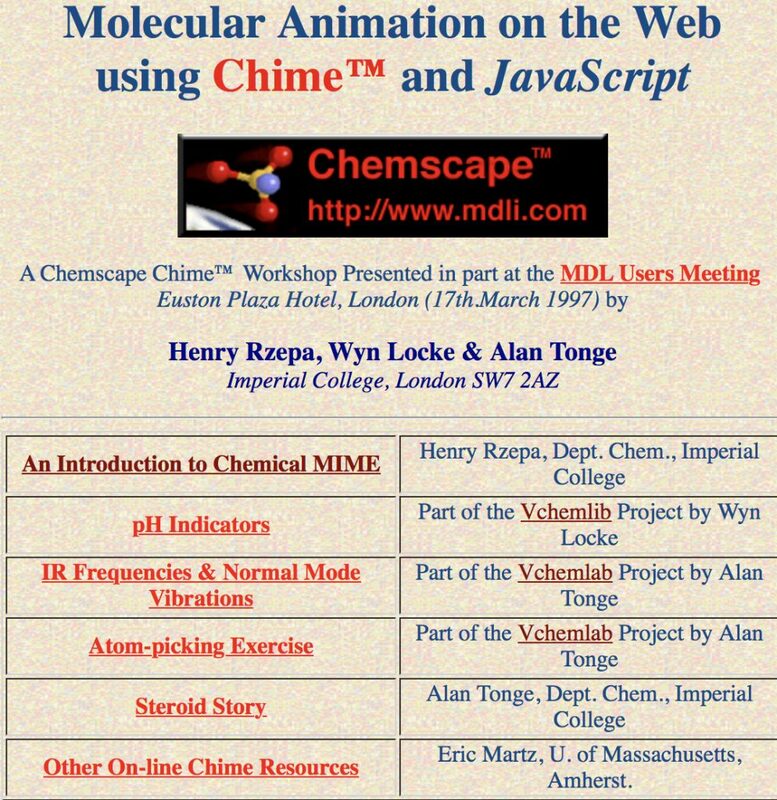 Jmol as a Java applet was released ~2002, at a time when Chime was still going strong. 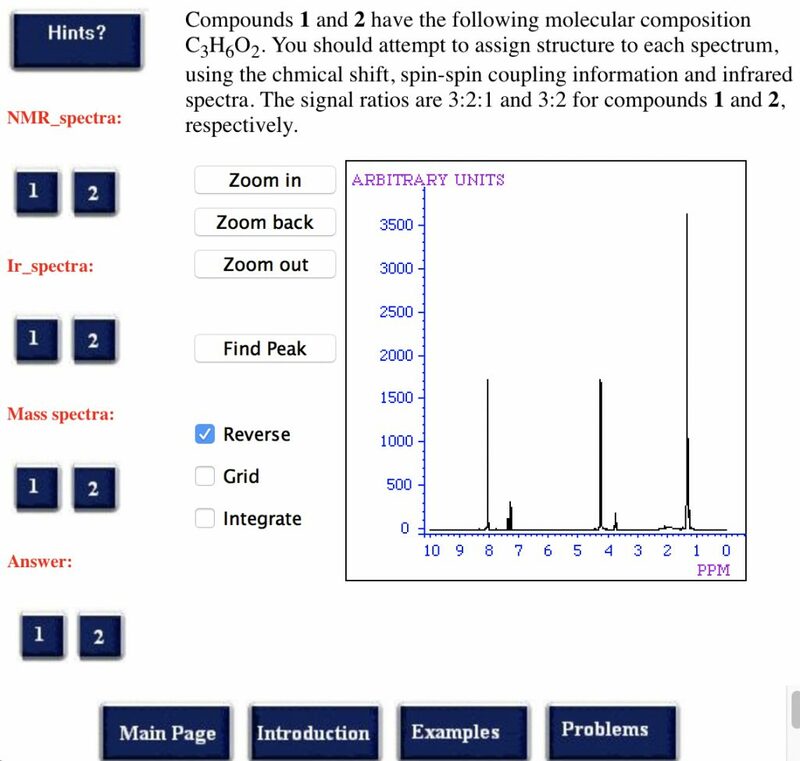 This interactive journal table (then associated with supporting information for article DOI: 10.1021/om049581h)) used a blend of Chime and Jmol to achieve interactivity. The Jmol (V10) still works if you use Safari. I have tried the latest version of the Apple Safari browser in macOS High Sierra. It continues to run Jmol (Java), provided the settings are as below. To clarify the above, support for the NPAPI plug-in architecture, which allows a Web browser to support Java applets is increasingly being withdrawn from the latest Web browsers. 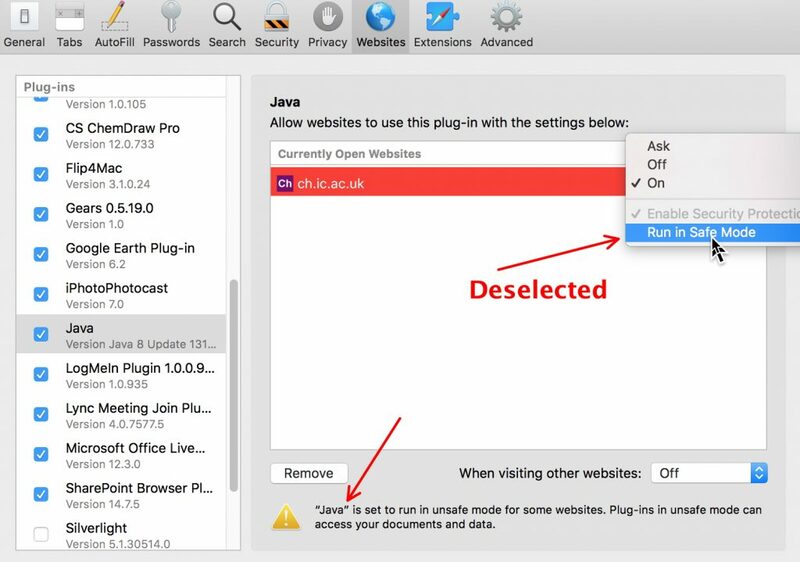 The latest Safari for example no longer supports this, which means that the mechanism above for enabling Java will no longer function. In March 2018, only legacy browsers now run Java applets within the browser. Edge does not support Java applets. However, you can ask Edge to open a particular website in Internet Explorer.